China's publishing industry plans to release some 132 types of Lei Feng-themed publications in memory of the country's icon of altruism, according to the General Administration of Press and Publication (GAPP). A young Chinese soldier in the 1960s, Lei Feng was known for devoting almost all his spare time and money to selflessly helping the needy. He died from injuries sustained from being hit on the head by a pole while helping a fellow soldier direct a truck on Aug. 15, 1962, at an age of 22. A year later, late Chairman Mao Zedong called on the entire nation to follow Lei's example, and March 5 of every year is designated "Lei Feng's Day." According to a GAPP statement, these publications, of which 65 have already entered the market, include compilations of Lei Feng's diaries, poems, proses, speeches and letters, analysis of Lei Feng's life and theories as well as stories of other contemporary altruistic models. "Interpreting the rich meanings of the Lei Feng spirit and its contemporary value, these publications aim to promote the society to learn from his spirit and put it into practice," said the statement. Several books saw immediate popularity upon releasing. "Lei Feng Quan Ji," or the complete writings of Lei Feng, has sold 200,000 copies since early February. Some of the publications will be released in minority languages or in electronic format, according to the GAPP. 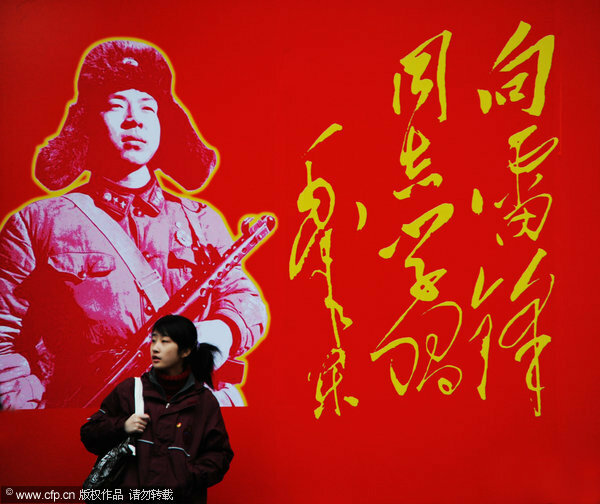 China's publishing industry plans to release Lei Feng-themed publications in memory of the country's icon of altruism.